Hello Friends, Rajasthan Public Service Commission is going to conduct written examination for assistant engineer posts. Candidates who are participating in the examination may download RPSC Admit Card 2018 from here. A written examination will take place from 16.12.2018 to 18.12.2018. The Department will get select candidates on the basis of Pre Exam, Mains Exam, and Interview. Participants may download their RPSC Hall Ticket 2018 before an examination. Here we gave you links to download it. For more details regarding Assistant Engineer examination 2018 may check below article carefully. Rajasthan Public Service Commission has issued notification for 916 assistant engineer Vacancies. Interested candidates may register online from 30.04.2018 to 29.05.2018. Now The Department has to organize written examination for Assistant Engineer Posts from 16.12.2018 up to 18.12.2018. Candidates may download their RPSC Admit Card 2018 by Registration Number or ID Password. 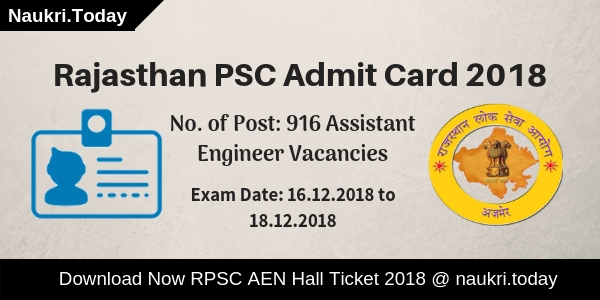 Here we provided you links to download RPSC Assistant Engineer Hall Ticket 2018. Fresh Update as on 20.02.2019: Dear Participants, Rajasthan Public Service Commission has issued AEN Mains Exam Date. The RPSC AEB Mains Examination will take place on 19.08.2019 to 23.02.2019. 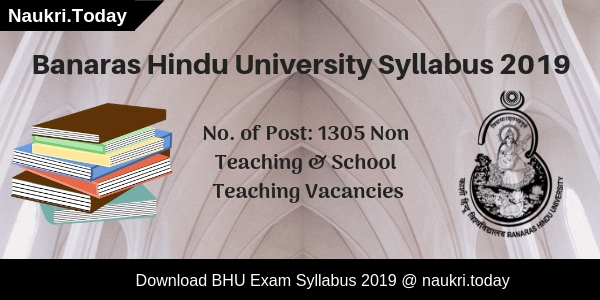 Candidates may download their RPSc Admit Card 2019 from linsk given here. Links Not active yet. Fresh Update as on 15.12.2018: Dear Participants, Rajasthan Public Service Commission is going to conduct Assistnat Engineer Examination. A examination will take place on 16.12.2018 to 18.12.2018. Participants msut be on time at exam center along with RPSC Admit Card 2018 & Other Documents. Fresh Update as on 12.12.2018: Rajasthan PSC Admit Card 2018 has released by the Department for Assistant Engineer Posts. Candidates may download RPSC Hall Ticket 2018 from links given here. An examination is going to take place on 16.12.2018 to 18.12.2018. Fresh Update as on 05.12.2018: Rajasthan PSC Assistant Engineer Examination is going to held on 16.12.2018 to 18.12.2018. Candidates may download their RPSC AEN Admit Card 2018 from a Link given here. The Department will issue RPSC Hall Ticket 2018 in upcoming days. Applicants should stay connected with us for details. What Should I Carry Along With RPSC Call Letter 2018? Rajasthan Public Service Commission Department has announced 916 Vacancies for the posts of assistant engineer. Candidates who have an engineering degree in any respective field may fill up an application form for RPSC Jobs 2018. Registration for RPSC Examination has taken place from 30.04.2018. The Last date of online registration for assistant engineer exam was 29.05.2018. Now the Department has conduct Pre-examination for AEN Posts. A Preliminary Exam will be held in two parts such as Paper I and Paper II. Check here RPSC Time Table for Preliminary Examination. For more details check below section carefully. Selection of Participants will take place on the basis of written examination and Interview. A written examination is divided into two parts such as Preliminary and Mains Exam. A Preliminary Exam should take place from 16.12.2018 to 18.12.2018. Participating contender may download their RPSC Call Letter 2018 from here. Candidates who qualify in preliminary examination will take part in the next level that is Mains Examination. It is estimated that a mains examination will be held after three months of pre-examination. Aspirants who successfully get clear in both examination will call for Interview. Candidates may download RPSC Admit Card 2018 before an examination. A Preliminary examination should be objective type in nature. It consists of two paper: one compulsory paper and one subjective paper. Total Marks of RPSC Pre Exam is 400 Marks. Candidates are informed that marks of prelims exam may not be counted for final selection. It is only conducted for selecting candidates for Mains examination. Now The Department has to organize written examination on 16.12.2018. Applicants may download RPSC AEN Admit Card 2018 from links given here. 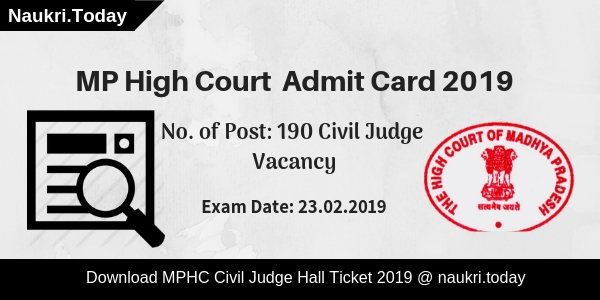 Candidates do not forget to carry RPSC Admit Card 2018. It is one of the important documents. Without this examiner will not permit you to sit in the examination hall. Candidates can download their RPSC Hall Ticket 2018 by ID Password or Registration Number. It contains a lot of important details such as Roll Number, etc. Here we provided you links to download it. Check here a list of details present on RPSC AEN Call Letter 2018. Aspirants do not forget to carry one ID Proof and two passport size photograph. ID Proofs are required to check the identity of applicants. It may also use for completing the attendance process. At the entrance of examination hall, Invaginator will ask you for your ID Proof and RPSC AEN Hall Ticket 2018. Here we gave you a list of ID Proof that you can carry at the exam center. Participants should follow these steps to download RPSC Hall Ticket 2018. The RPSC Preliminary Exam will be held on 16.12.2018. Here we gave you links to download RPSC Admit Card 2018. Log on to the official website of Rajasthan PSC i.e rpsc.rajasthan.gov.in. After that click on Candidates information option given at Homepage. Now click on RPSC Admit Card section. Enter your ID Password and Registration Number. Now your RPSC AEN Call Letter will appear on your computer screen. Conclusion: Rajasthan Public Service Commission will organize written examination for 916 Assistant Engineer Posts. Candidates may download their RPSC Admit Card 2018 from links given here. Do you want to download RPSC Admit Card 2018 for Assistant Statistical Officer Examination? if yes, then here is the latest news for you. Rajasthan Public Service Commission is going to conduct examination for filling up 225 Assistant Statistical Officer Vacancy. The ASO Exam will be going to held in the month of July 2018. Applicants who have successfully filled the application form waiting to download RPSC ASO Call Letter 2018. You can download your Rajasthan RPSC Hall Ticket either here or official site. Furthermore, information, how to download Rajasthan PSC Assistant Statistical Officer Admit Card 2018 ? and other is available on below section. Rajasthan Public Service Commission will take place Assistant Statistical Officer examination. The test will be going to organize in the month of July 2018. Applicants who are interested to download RPSC ASO Admit Card 2018 can get it either here or official site. Earlier RPSC has issued notification for 225 ASO Vacancies. The written examination for Assistant Statistical Officer will be conducted by the department. After that, candidates must need RPSC Call letter to attend ASO exam. Furthermore, details like when we download RPSC Admit Card for Assistant Statistical Jobs? check below section carefully. Rajasthan Public Service Commission has issued advertisement on 28.03.2018. There are 225 Assistant Statistical Officer Vacancy. The online registration starts for Assistant Statistical Officer Exam from 17.04.2018. Last date of online registration is 07.05.2018. Candidates can correct their online form before on 13.05.2018. A lot of candidates were filled the online form. Applicants who have successfully applied for Assistant Statistical Officer Examination are waiting for RPSC Admit Card 2018. Now the time to collect Rajasthan PSC Call Letter 2018 either here or official site. As per exam point of view, it is necessary documents. If you don’t have RPSC Assistant Statistical Officer Hall Ticket 2018 in examination hall, you can’t attend the test. So you must download it either here or official site. Without RPSC ASO Call Letter you can’t enter in the examination hall. It is very important document according to examination point. Your RPSC Admit Card 2018 also contain details of needed on examination. It contains information of your examination center, Date & time and other. So to download RPSC ASO Hall Ticket 2018 you must remember application id, DOB. So other information which is mention on your Rajasthan PSC Call Letter is mention below. Applicants who are going to attend the examination must have photo id and one photograph with RPSC ASO Admit Card 2018. If you don’t have id proof or photo with your call letter you will be terminated. here in below section, we provide you list must carry with Rajasthan PSC Assistant Statistical Officer Hall Ticket 2018. Candidates who have successfully filled the online application form can download RPSC Assistant Statistical Officer Admit Card 2018. You can download it through online mode only. By downloading RPSC Call letter, you must remember your application id and dob. In the dialogue box you require to enter application id, dob, and captcha code. After that you can download Rajasthan PSC ASO Hall Ticket 2018. First of all go to official site rpsc.rajasthan.gov.in. Go to download RPSC ASO Admit Card 2018 section. Find the link to download Rajasthan PSC Exam Call letter 2018. Enter your application id, Date of birth and image captcha. Click on submit button and then new window will open on your screen. Your RPSC Admit Card 2018 is now available on your eyes. Check Examination center, date & time and other information. Download RPSC Exam Hall Ticket 2018 and then take hard copy of it. You can direct download it through below links. Conclusion : Rajasthan Public Service Commission is going to release RPSC Admit Card for Assistant Statistical Officer written examination. The examination will going to held on June/July 2018. Applicants who are interested can collect RPSC ASO Hall Ticket from here.